Spring arrived this past week, ushered in by a series of Northern California storms that soaked the earth and left the air smelling of fresh rain. This is my favorite time of year. Spring brings rebirth and renewal. The days are growing steadily longer. Grasses seem to sprout from nowhere overnight, and wildflowers will soon carpet the hills in a splendid technicolor coat. Signs of the changing season are everywhere. From behind my home, the neighborhood flock of wild turkeys announce their presence as they forage for bugs surfaced by the rain, while agile swallows perform a dip and dive arial show off the front deck. A temporary break in the morning weather prompted me to hurry outside for a hike. I love being in nature, especially after a rain shower. I was mucking along the trail when I spied a familiar patch of green off to one side. 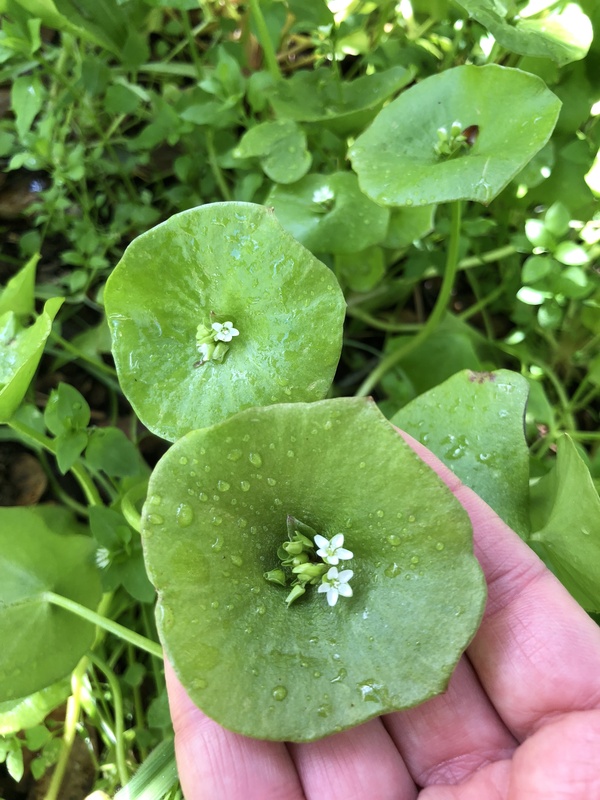 Miner’s lettuce! I instantly recognized the bright green saucer-shaped leaves suspended by stems several inches off the ground. 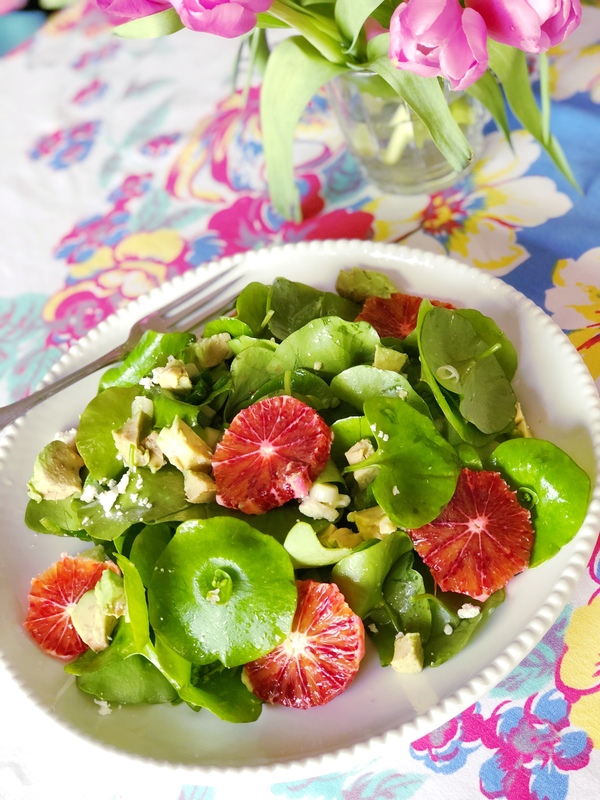 This wild foraged green is a spring delicacy with a mild, sweet “green” flavor, and a soft texture that makes a beautiful salad. When mature, the lettuce sprouts a cluster of tiny white flowers at the center. The plant came about its name during the California Gold Rush when it was a popular forage item eaten by miners. It is a common native species in California from Sacramento to the San Joaquin Valley, and sprouts in abundance in areas of filtered sunlight among fir, pine and oak trees following the first heavy rains. I reached into my daypack to grab the bag I always bring when hiking (for just such good fortune), and set about plucking as much lettuce as it would hold. Back in my kitchen, I gently rinsed and dried the leaves to make the perfect lunch. Foraging connects us back to nature and puts us in touch with a primal part of ourselves we rarely acknowledge in today’s fast paced, fast food culture. It requires us to slow down, explore, be aware of our surroundings, and reap the bounty of each unique season. I hope, dear reader, that you too will be inspired to connect with your wild side, as you remember that simple pleasures are truly the best. 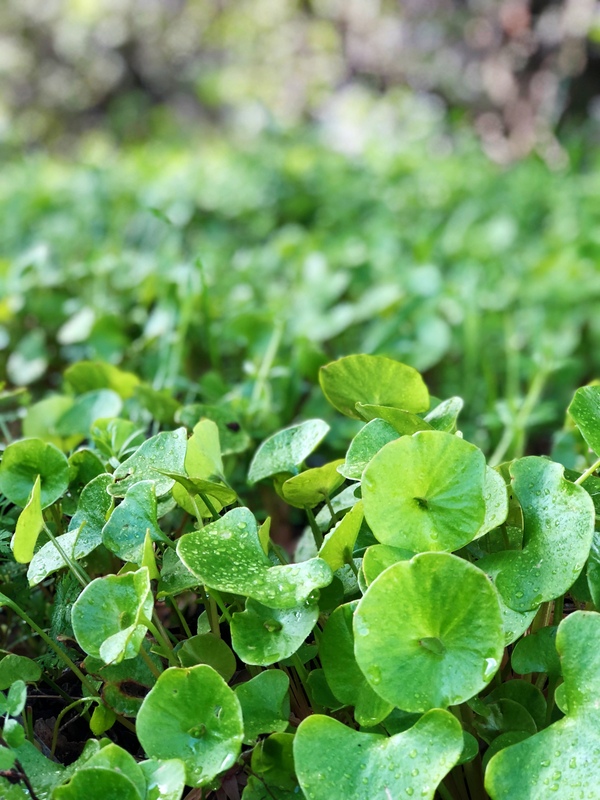 Gently rinse and spin dry the Miner’s lettuce. Place in a large bowl with the green onion and mint. Drizzle in equal amounts of champagne vinegar and olive oil (about 1 to 1 1/2 tablespoons each). Toss lightly, taking care not to crush the tender leaves. Plate the greens. 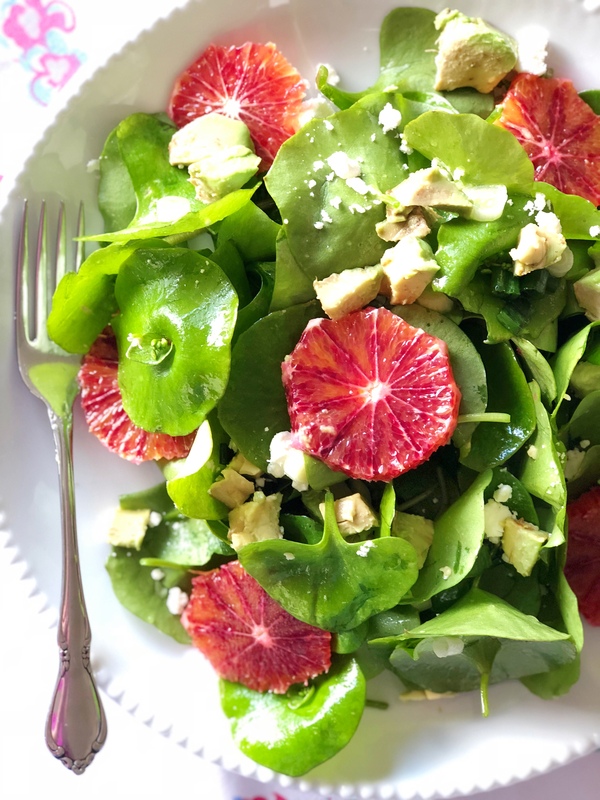 Top with avocado, blood oranges, and feta cheese. *Add additional protein if desired. Smoked salmon is divine! Looks delicious – I’ve seen this on hikes; now I know I can safely eat it. Absolutely beautiful and so spring looking. Thanks SO much for the salad recipe, Karen! I was out walking the other day and commented to my husband about the Miner’s lettuce and how much I loved seeing it. I did not know we could eat it! Back to my walk! I hope it is still there! 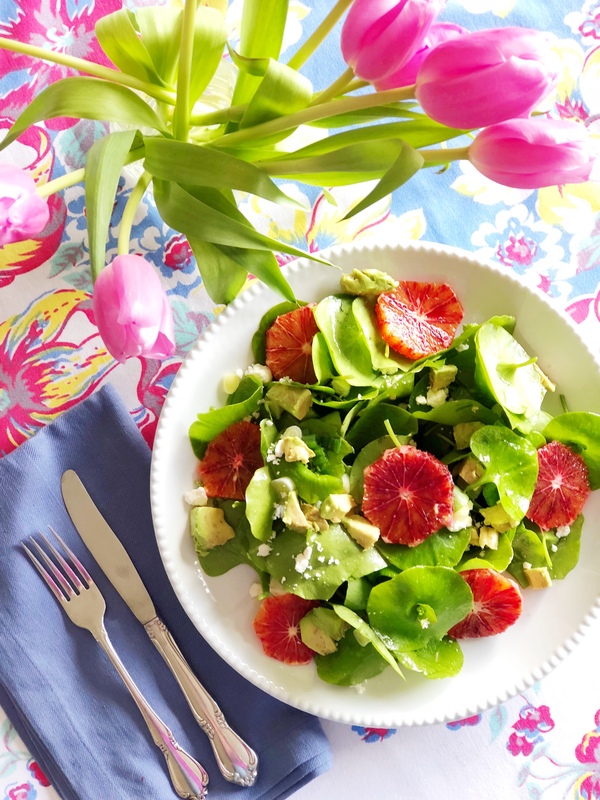 Your pic of the salad is perfect!!!!! Enjoy it Christine! It’s delicious. These rains should keep the bloom going for awhile. Let me know what you think.